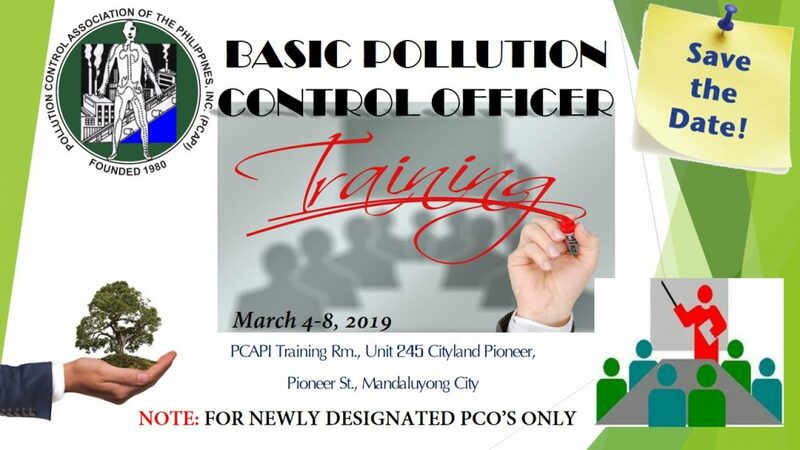 The Pollution Control Association of the Philippines, Inc. (PCAPI) National, in collaboration with the DENR is undertaking a continuous training for Basic Course for Newly Designated PCO, a copy of which is also herewith attached for reference. This training program is recognized by DENR – EMB. This letter serves as an invitation for the training of your newly designated PCO. Completion of the 40-hours training, supported by a Certificate of Completion will be distributed at the end of the training course, of which shall be used for your PCO accreditation which is provided under Section 8, DENR Administrative Order No. 2014-02. The Basic PCO Training Course is scheduled tentatively on March 4-8, 2019, from 8:00 am to 5:00 pm (5 days) at the PCAPI Training Room, Cityland Pioneer, Pioneer St., Mandaluyong City. Participants will be limited up to forty five (45) only. Reservations, therefore, will be on a first-come-first-served basis. The training fee is P10, 000 per participant for non-PCAPI members and P9, 000 per participant for (PCAPI) members; inclusive of meals, cd presentations and Certificate of Attendance. Deadline for reservations is on March 1, 2019. Please settle your training fees on or before March 4, 2019. Account Name: Pollution Control association of the Phils., Inc. I have yet to attend the seminar. I will post my comment as soon as I finish the training. I have yet to attend.